November marks the start of the holiday season. Many of us begin to make holiday preparations for Thanksgiving, Christmas and New Year’s. During that time we spend time making lists, shopping, decorating, writing cards and letters, attending parties, creating meals and more. During this time, we also can find ourselves, happy, but anxious and stressed out. But like everything in life…we should pause and reflect on what’s behind us and what’s ahead. It’s no different here at Rainier Fruit. Harvest season is our holiday season as well. We rush from orchard to orchard without a break. Just like the holidays don’t wait if we don’t get everything done, our fruit doesn’t wait either. When it’s ready…it’s ready, even if we aren’t. We pick, we pack, we ship, we repeat. And just about the time all the fruit is picked from the trees and nestled safely in its boxes like kiddos in bed on Christmas Eve…our phones ring and our emails beep as the holiday orders start flowing in. We too forget how important it is to be thankful. To remind us the importance of living Wholesome to the Core, we created a list of just a few things to be thankful for. Family – the one you were born with and the one you create. Print out our free printable calendar that you can post and look at every day. Take a moment and be thankful for your many blessings and gifts. 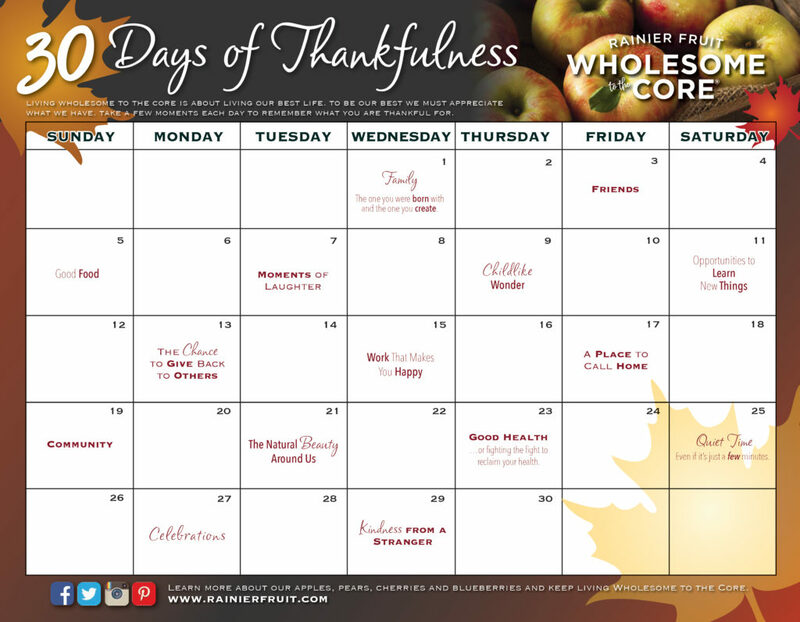 Choose the empty days to select other wholesome blessings that you are specifically thankful for as well. May your holidays be filled with everything that makes life Wholesome to the Core.